The common dayflower looking like a three-eyed mouse is edible. Mixing in with other plants in the garden is a clumping, grass-looking plant with alternating leaves clasping around the stem. 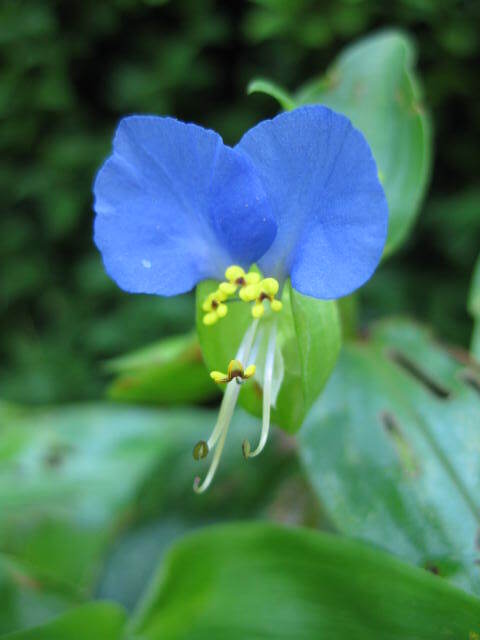 Only after the blooms begin would one notice the common Asiatic dayflower weed (Commelina communis). Looking like a cute, three-eyed little mouse, this Asian annual has two, iridescent cornflower-blue petals spread like ears, and a small, inconspicuous white petal underneath. Three yellow staminodes with dark-red centers look like eyes, while the lower stamen and style resemble the nose and whiskers. Behind many of the mouse-flowers, are two, oval leaves closed as if in prayer, preparing to open on the following day to expose another little mouse. Apparently, Carl Linnaeus, who came up with most of the botanical names for the plant world, inserted his notorious humor when he named the dayflower, Commelina, after three sons. Two of the sons had become famous botanists — represented by the two large petals, while the third son chose a less admirable path — represented by the inconspicuous white petal underneath. Growing in disturbed areas in full sunlight, the common dayflower appears in most regions of the Eastern United States. Some folks call it a troublesome weed, but if you eat it, or use it medicinally, it’s not so troublesome. I think it’s rather sweet to have in the garden. Leaves and shoots are edible with a green-bean flavor, and can be used in salads, or minimally cooked with other greens. The flowers, which bloom only for a day from May until October, are adorable additions to salads, or as a decorative accent to cupcakes. The small seeds taste like peas and also are edible. In China, the above-ground parts are used to cool fevers associated with the common cold and flu. A recent study on cells from dog kidneys and in live mice found that the common dayflower had a protective effect against the H1N1 influenza A virus. Other medicinal uses for the dayflower are as a diuretic, eliminating excess fluids or as a gargle for sore throats. Topically, the plant can be mashed and applied as a poultice to cool inflammation on the skin. Dayflowers collect excess copper in the soil, which makes them useful for phytoremediation, a process of restoring the soil after contamination from industrial pollutants. As an annual, the best way to keep this plant under control is to use it, preventing it going to seed, which you can easily do either by eating it or using it medicinally.